1 of 5 Heat oven to 400 degree F. Spray a baking dish with nonstick cooking spray. 2 of 5 Mix together the mayonnaise and cheddar cheese. Place the fillets in the baking dish and fold in half. Evenly divide the mayonnaise mixture over each and spread evenly. 3 of 5 Bake fillets at 400 degree F for 20 minutes or until fish flakes easily. 4 of 5 While fish is baking, prepare couscous and spinach following package directions. 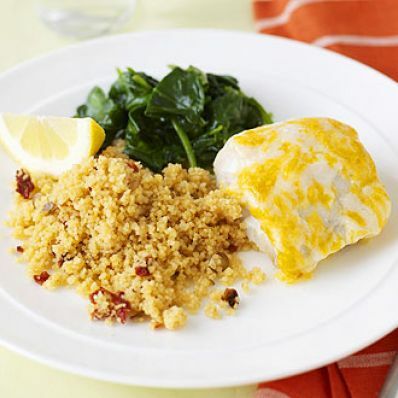 5 of 5 Serve fish fillets with couscous and spinach alongside.